Lake Kivu is an extraordinarily beautiful inland sea enclosed by steep, green, terraced hills along the Congolese border. 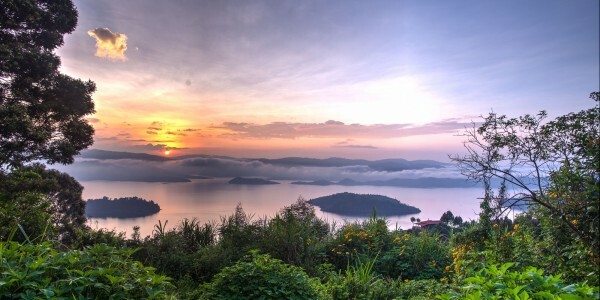 Three resort towns, Gisenyi, Kibuye & Cyangugu stand on the littoral, connected by a twisting road that tumbles through lush plantain fields and relic patches of misty rainforest to offer sweeping views over the blue water. It is one of the classic road journeys in all of Africa. There is also a charter boat service on the lake connecting the three towns. Why visit Lake Kivu ? 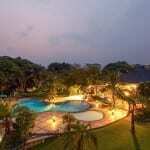 Gisenyi is the most developed of these resorts and lies less than an hour’s drive from the Parc National des Volcans. There is a sandy beach lined with swaying palms and colonial-era hotels that exude an atmosphere of tropical languor. 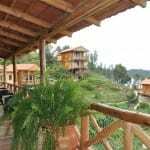 At Kibuye to the south, tourist activities are centered on a modern lakeshore guest house overlooking pine-covered hills. Different again is Cyangugu, close to the Nyungwe Forest, whose more subdued tourist development is compensated for by a stirring setting of curving inlets winding into narrow valleys. Away from the main resorts, Lake Kivu offers visitors rewarding glimpses into traditional African culture. Here, fishermen ply the water in dugout canoes unchanged in design for centuries, while colourfully dressed ladies smoke traditional wooden pipes and troubadours strum sweetly on stringed iningire (traditional ‘guitars’). The birdlife is fantastic: flotillas of pelicans sail across the open water, majestic crowned cranes preen their golden crests in the surrounding swamps, while jewel-like malachite kingfishers hawk silently above the shore.